Hey! Its long time since I have posted on All Blogger Tricks. I have now shifted to a new school and I am now in the 11th grade so I hardly get any time. 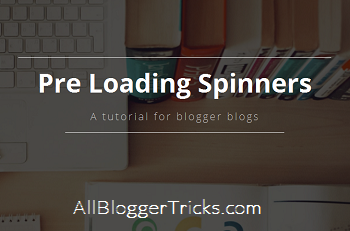 Still I managed to write down a post for my readers :) This tutorial will show you how you can add pre loading spinners to your blog. Many of you may have seen it and for those who haven't; its an effect added to blogs which is showed on before the site has loaded completely. Once the site is loaded it slowly fades away. We encourage everyone to add one of it, as it makes the web more beautiful. Coming back to the post, here I have 5 spinners tweaked for your blogger blogs. The respective coders of these spinners have been credited in the demo page under their creation. You can see the demo below, and ofcourse there would be no fade effect in the demo but surely in the code you would add in your blog. If you liked any of the spinners and want to add it to your blogger blog then you need to copy the below given code of the respective spinner and paste it just below <body> tag. Also if you already have jquery plugin in your blog you can remove it from the code. Add anyof the above code just below the tag <body> and save the template. After that you would see the loading effect in your blog everytime before the homepage loads. thanks bro... its really amazing i added demo in my blog its looks ausome.. Thanks for posting such a nice widget for blogger. Can you please post facebook recommendation bar ?? Demo 2 is not working properly. After opening the web site, the looks of the website became different. Awesome, thank you so much for this tutorial. Nice post guys.. thx very much..
in which page? can be more specific? nice collection but i a confused how to implement this code as Status is not clear.